Organizations that want to achieve better quality, lower costs, or greater efficiency need employees who are willing and able to look at their day-to-day routines—and look beyond them—to identify new and different approaches. Managers who want employees to be empowered must give those employees the confidence and skills they need to assume an active, involved role in the workplace. “Challenging the Status Quo” meets this critical competitive need by showing participants how to develop and present their ideas safely and effectively. It can be tailored to an organization’s overall needs, or it can focus on specific areas such as quality, safety, delivery of products or services, or work processes in general. Do You Know the Personality Styles of Your Colleagues? Tired of management doublespeak about “strategy” and “paradigms shifts?" 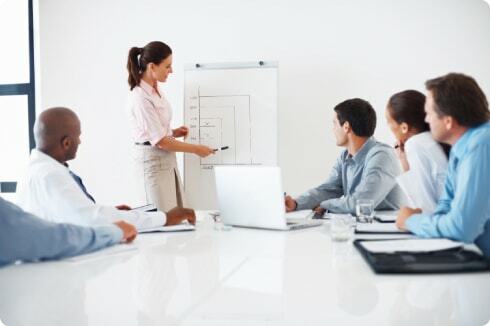 Our practical, results-oriented training programs increase productivity, effectiveness, & performance in the workplace. We have been resolving employee development, leadership, generational, professional presence, and personal effectiveness issues for over 30 years. Contact us to find out what we have done for other organizations and how we can help yours. Please enter your information below so we can promptly email you a link to access a copy of the whitepaper. Download our practical takeaways for communicating to manage performance, put them to use, and increase your impact today. Our guide will help you utilize your most valuable capital –human capital! Increase employee effectiveness & productivity today. We'll send you the industry data and updates that you need! Save time- your most valuable resource-by receiving concise, cutting edge information in your inbox. We have spent over 30 years learning the core skills that define high performers. The Power of Personal Effectiveness infographic will guide you through utilizing your most valuable asset –human capital! and updates that you need!